Well here we are. Since I started back in July 2010 on my quest to try and understand tai chi scientifically, I have finally reached my 100th post milestone, which is a good opportunity for a bit of reflection. I have enjoyed writing this blog immensely, not least because it has help me to develop and refine some of my ideas. Equally, it has been a useful archive for me to gather all my thoughts together in one place, which I'm sure would otherwise have been lost! In the course of my writing I have discovered a small number of others, who would seem to have a similar outlook or agenda to myself (e.g. Martin Mellish, Meditation in Motion, Martial tai chi, The Qigong Institute, The Australian TCCLCHSoHSD). But we are quite definitely in the minority so I'm glad to be helping to fill the niche. To me, being part of this evolution-in-tai-chi thinking movement (as I might rather grandly characterise it) is exactly where I want to be. On the cutting-edge of developing tai chi, treading ground that is not well trodden and [business speak mode] removing the barriers to promoting tai chi beyond its core market (i.e. hippies and senior citizens). Of course I'm only a tiny cog, but I'll keep rotating. For me, I feel that the most significant development of my own thinking that has so far taken place, is with my understanding of chi. I always felt that chi was the elephant in the room for tai chi in Western cultures. It sits there rather uncomfortably as this nebulous quasi-religious beast. Western tai chi teachers have to choose between either being a zealous new age preacher type, or trying to brush it under the carpet in a rather embarrassed self-conscious way. I do not want to conform to either of those types, and this blog has been, and will continue to be, a way for me to explore the third way, the scientific way. My 100 posts have now got me to a point where I am entirely comfortable with the fact that, through rational deduction, it is quite apparent that chi does not exist. There is nothing supernatural, mystical, occult, or non-scientific about it. Chi is a concept nothing more. Paradoxically however there is a wonderful duality about it, because it is in fact meaningful and powerful. An extremely good analogy is that of love. Love is also a concept, but not a physical object that can be measured. I'm sure however there are many who would argue that love is one of the most powerful forces in nature. So where to now for my next 100 posts? Who knows. But I feel like I should return to my mandate of trying to translate Eastern concepts into Western concepts. Just like learning tai chi, I will aim to drop a level of subtlety refining my ideas into more detail - spiralling down and going deeper.... 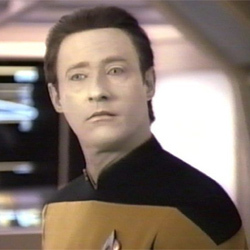 The guiding motivation I always like to picture is that of Star Trek's Data walking into one of my tai chi classes. How would I teach him? He wouldn't be capable of "feeling the chi", but he sure as hell would have the potential to become the greatest tai chi grandmaster in all of history! Finally a thank you to all of you who have visited, subscribed and commented on my blog in the last two years. You have been immensely helpful to me and it is rewarding to know that there are people out there reading and thinking about my work, even if I never know who or where you are. THANK YOU!! Peace, Love and Chi to you all.